Some translations use ‘children’ rather than ‘sons’, but I deliberately chose that particular translation in an attempt to open up a discussion about ‘sonship’ and what it means in the New Testament. The concerned person felt that the word ‘sons’ in this context is simply another example of biased translation in favour of males and therefore should be rejected. And trust me there are plenty of examples of inaccurate and biased word/phrase translations in the Bibles many of us use. However, I respectfully disagree with the viewpoint that the use of the word ‘sons’ in this verse is faulty, and here’s why. The New Testament often uses metaphors to convey a specific idea. 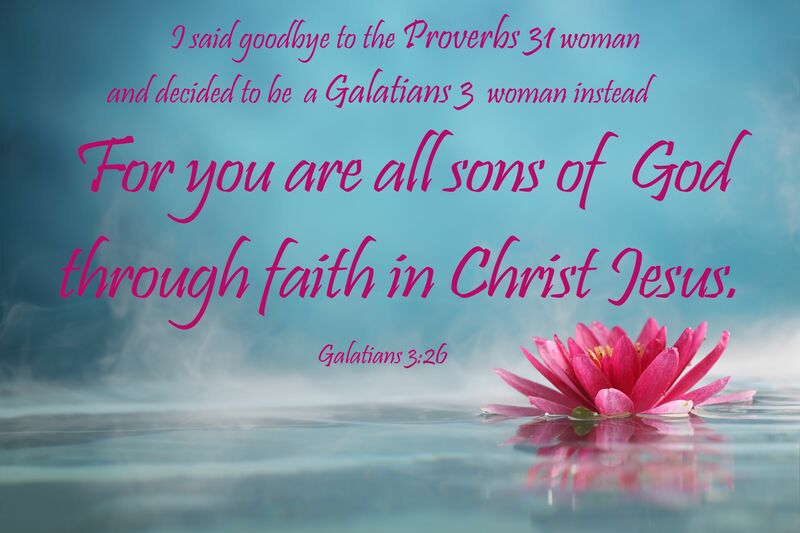 Sonship as referred to in Galatians 3:26 is a metaphor conveying a specific spiritual concept, just as ‘bride of Christ’ and ‘body of Christ’ are also metaphors conveying aspects of life in Christ. Metaphors are not gender specific. When Jesus was in the flesh, He had a male body, but no one would suggest that Biblical references to ‘the body of Christ’ include only males. When Jesus spoke of the woman who searched for the missing coin He wasn’t speaking specifically about females, He was conveying a lesson using contemporary cultural customs (Luke 15:8-10). In Jesus’ day it was women who lit household lamps and kept the home clean. If he had described a man sweeping His house His listeners would not have related to the parable. Similarly, when Jesus wanted to teach about perseverance in prayer, He used the example of a widow who pestered the judge to give her legal protection (Luke 18:1-8). Everyone in that time and culture knew that a vulnerable widow, more than a man, could very well find herself needing legal protection from her oppressors and having no other recourse but the local magistrate. The metaphor of a devoted, adoring bride is used in the New Testament in relation to covenantal relationship with Christ (Jn. 3:29; 2 Cor. 11:2; Rev: 21:2,9). Most of us accept that male believers may have difficulty embracing this bridal metaphor from a cultural and experiential viewpoint, but this does not cause us to say only females can be regarded as the bride of Christ. We also know there are many Christian men who do not consider being part of Christ’s Bride an affront to their manhood. Some other New Testament metaphors for God’s people include ‘temple’, ‘vessel’ ‘vineyard’, ‘flock’, ‘household’, ‘city’, and ‘light’. The problem seems to be the word ‘son’. The Greek word ‘huios’ used in this verse is commonly used for male offspring (e.g. Gal. 4:30), and sometimes also for multiple, non-gender specific children (e.g. Rom. 9:27). There is another New Testament Greek word for ‘children’, ‘teknon’, but this is not the word used in Galatians 3:26. When the Bible speaks of God’s fathering relationship with His individual people it is clear that relationship includes both sons and daughters. For instance when Paul was imploring the Corinthians as his spiritual ‘children’ he reminded them that they belonged to God by paraphrasing Jeremiah 31:9 “‘And I will be a father to you, and you shall be sons and daughters to Me’ says the Lord Almighty.” (2 Cor. 6:13, 18). Jesus also used the word ‘daughter’ and the phrase ‘daughter of Abraham’ (Mark 5:34, Luke 13:16). There is no question that God delights in all His children, both daughters and sons, and loves and equips them equally. But there is also a metaphor of sonship in the New Testament which relates specifically to a believer’s spiritual inheritance and authority in Christ. Jesus used this metaphor in the Sermon on the Mount: ‘Blessed are the peacemakers, for they shall be called sons (huios) of God’ (Matt. 5:9, see also Matt. 5.45). Here He used the phrase ‘sons of God’ to teach that all believers can inherit their Heavenly Father’s likeness. To the people He was teaching, inheritance was for sons. However, it would be foolish to say Jesus meant only males could be peacemakers based on this verse. The comparison here is not between males and females, but between sons and slaves. In the Roman ruled culture in which Paul was writing, everybody understood that a slave was one who was bound to a master and was not free to follow his/her own pursuits. Everyone also understood that an adopted son was a male chosen by a Roman citizen to inherit his estate and perpetuate his name. Under Roman law an adopted son was legally entitled to all the rights of a naturally born son with no exceptions. Additionally, every debt formerly owed by the adopted son was wiped out. He would forego all rights of a natural son in his former family and gain all rights of a natural son in his new family. His former life was literally no longer existent. The cultural metaphor of an adopted son in Roman law was used here by Paul as the clearest way to explain the finished work by which every believer has now become a joint heir with Christ. This spiritual concept of sonship is not about gender but every believer’s new position in Christ. In the setting in which Paul was writing, sonship was necessary to become an heir. If he had written in terms of an adopted daughter, His readers would not have understood the concept of full inheritance he was trying to convey. Paul then continues by using the progressive terminology of children, heirs and joint heirs. We first become children of God when we believe in Christ, but God also makes us heirs (sons) and, even better, joint heirs alongside Christ, meaning nothing that is Christ’s is withheld from us – male or female. God the Father has adopted all believers as His children, and also made all believers His heirs (sons) in the sense that He has guaranteed us a spiritual inheritance that cannot be taken away (1 Peter 1:4). Slaves on the other hand had no inheritance. New Testament “sonship” is a spiritual position that clearly belongs to all who believe in Christ Jesus, male or female, in the same way that brideship belongs to both His female and male followers. It is not about male or female gender, it is about being joint heirs together because we are now ‘in Christ’. And that is cause for celebration! Thank you, Cheryl, for polishing this facet of the Word so clearly. There is a new depth of understanding our spiritual inheritance and residence with and in Christ when the message of the sons of God is imparted and received into our spirit. ‘…the eyes of our heart being enlightened…’ Eph. 3:18 Bless your heart! Thanks Nancy. It’s important that women grasp this concept. I believe Scripture teaches gender equality. I agree that Paul was using a Roman metaphor of sons on inheritance. But as women can now inherit in the West, I think the best English translation of huios is children. That is, “children” conveys in English the point Paul was making in 1st century koine Greek to the Romans when translating into a culture in the modern Western world. Translating it as “sons” is too specific, I think. All the details can be explained when going through Scripture word by word and verse by verse, but when simply reading large passages or reciting in public, I think understanding by the average listener is important. On Luke 15, I like Ken Bailey’s insights. It is true that a woman would be the normal one to search in her house, but the decision to set the scene in a house was by Jesus, he could have set it in a field and then a man would be the normal one to search. In other words, Jesus is carefully crafting the triple parable to plant a repudiation bomb in the minds of the Pharisees when they meditate and perhaps figure out the meaning of the triple parable. God is like a shepherd (might be either gender, but low class), a woman and a father who acts disgracefully lovingly; and Jesus is like God. In other words, Jesus is deliberately mapping a woman onto himself, something the Pharisees would never think to do. Thanks for your insights Don. I’m glad we agree that Paul was using a Roman metaphor of sons on inheritance. Ishshah’s Story has many subscribers who are not in Western countries and who do not enjoy the inheritance laws some of us in Western countries do. Also, the article was written in response to a particular viewpoint that took offence at my reference to women as ‘sons of God’ (in terms of inheritance), so the explanation of ‘huios’ is important in that context. I make no claim to be a Greek scholar by the way. I agree Jesus was deliberately mapping a woman onto himself in the parable of the woman searching for the coin, and that is absolutely wonderful, but the point I was making is still relevant for the purpose of the article. Thanks for sharing on Ishshah’s Story! Thanks Cherly for this clarification. This is an area I have never really known how to explain. I get it now. Wonderful Lydia! So glad you ‘get it’ that you are also a son of God.